Yep, we have backup water bowls for our outside sweeties when their water freezes, but that's seriously frozen! You are so special to take care of the outside cats!! Plastic breaks easily in your crazy cold weather! Sending warm Texas thoughts your way. Yep, I always sing old folk songs when I do things like that too! Good thing the O'Cats have got you! I'm so glad the kitties have you and the hubby to care for them! 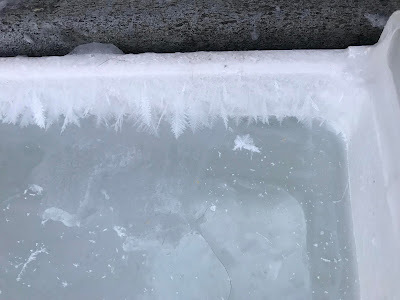 I lost many a water dish before I wandered into a Tractor Supply store and found rubber bowls - some hold a quart some half a gallon, They are thick enough that you can flip them over and stomp on them to dislodge the ice. Any farm supply store should have something like that. They will also have heated water bowls. They aren't terribly expensive. (The heated ones are +-$15) Good luck to all of you. I purchased a 2-quart rubber bowl from Tractor Supply this weekend, and am allowing it to 'outgas' before I put it in use. The stink from that rubber...ew! Thanks for the suggestion! I don't like the heated water bowls, just because 1) they are made of plastic, and 2) they don't keep water liquid when it really gets cold, and 3) our outside electric outlet was installed in the 1940's, so we've already got a warming pad plugged in, and don't want to overload the fragile system. You definitely need a hammer. Kitties need heated water boxes—or ice skates. Water is always such an issue for outdoor critters when the temperatures plummet. Yeah, sometimes dad can be like that. He tries to be all manly and whatnot and tries to show mom his masculinity and ends up breaking sh*t. We gotta love him! Enjoy your weekend. Oh my gosh. Hammers and cold brittle plastic don't mix! It's cold enough here to keep icing over the outsider-cats heated water-bowl. I guess it wasn't meant to keep water liquid at -25 degrees.